Salt Lake City is a pretty sweet destination for family travelers. We recently had a family reunion in town and had some time to break away from bowling get-togethers and picnics in the park to explore some of our old haunts around town. My husband grew up in Salt Lake City and lived there for a while after we met. It was a lot of fun to get out and show our Little Monster some of our old haunts, but also to see them with new eyes…as in eyes that required looking for stroller access or inclines that were way too steep for our out-of-shape selves to climb up with a baby carrier attached to us (hey…we haven’t had a lot of time in the past year to get to the gym, okay?) Or at least to quickly buzz through them because, let’s face it, it was July when we visited and anything outdoors was only fun for about ten minutes before our pale, Northwest skin began to grow weary of the blazing sun. This list of things to do with a baby or young toddler keeps in mind nap schedules and short attention spans – nothing is out of town or tough to get to. You won’t find high adventure on this list. 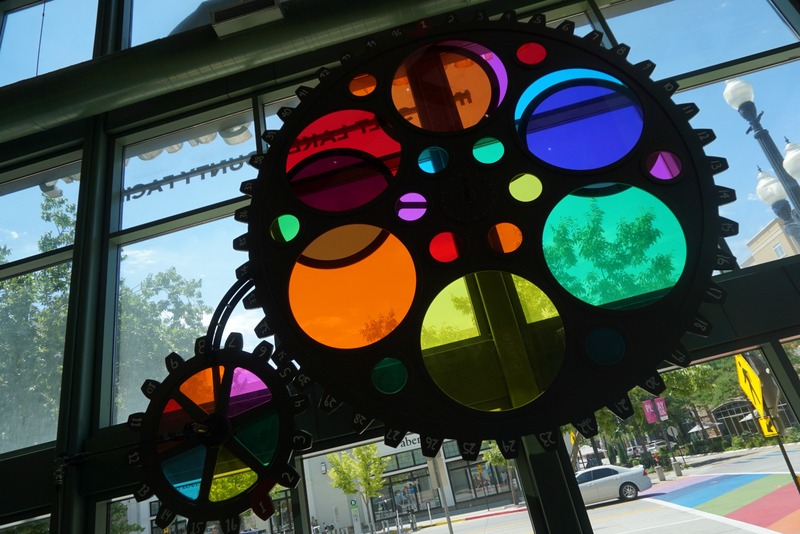 Just some ideas to get out of the house or hotel room to get your little one a change of scenery while enjoying some things that make Salt Lake City what it is at the same time. Blow some bubbles at the park…it’s good for the soul. Liberty Park is awesome for kids of any age, including babies. It’s even awesome in way-too-hot July because there are lots of big, giant trees that make big, giant shade. Ahhh. Our Little Monster can’t really run and play yet, but she likes to think she can. So we took some time out to kick back on the grass near the playground, let the little watch the kids who could run around, and blow some bubbles. Because if you aren’t traveling with bubbles, then don’t even talk to me. Of extra interest to babies is also the Tracy Aviary located within the borders of the park. If your baby is very small, this is a peaceful place to walk. If your baby is a little older, this is a place where they can practice pointing and saying “ba” at the birds. It goes without saying that a zoo is perfect for kids of all ages, but zoos can be great for anyone traveling with babies or small toddlers. Especially great for tiny travelers at Hogle Zoo is the Rocky Shores exhibit where little zoo-goers can watch sea lions, seals, and otters swim under water. I find that any zoo exhibit with an underwater view is far more interesting than the general zoo animals for my Little Monster. My guess is that it’s way easier to figure out what to look at than a tiger hiding in the grass in a larger enclosure. If this rings true for you, then just know there’s also the Living Planet Aquarium not far from Salt Lake City in Draper. 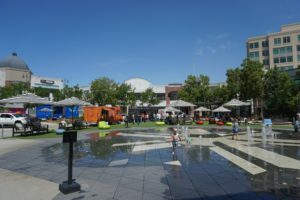 The Gateway has a fountain for kids to play in, food trucks and seats to kick back under an umbrella. The Gateway is an outdoor shopping center downtown, but don’t write it off as your usual everyday mall. If the weather is hot, there’s a fountain where kids can play (the kind where water jets pop out of the ground). Next to the fountain are covered benches and seats for the grown-ups or tired kids to kick back. Sometimes there are food trucks parked nearby as well. But it gets better. The Discovery Gateway children’s museum and Clark Planetarium are here, too, and great for toddlers who need to climb around and explore a bit. If your baby is younger or not walking yet, The Gateway is nice just to wander around with a stroller too. Though, be warned, it’s all open-air so if the weather is 100 degrees, so are you. Sugar House is a neighborhood in Salt Lake City that was one of my favorites to hang out in before I had a child. It’s equally as perfect if you have a child. It feels a little more relaxed than walking around downtown. There are plenty of sidewalks to wander along whether you’ve got a little one in a stroller or in a carrier, and plenty of shops and restaurants to duck into. Sugar House Park is here too, which has a walking path, plenty of grass, and a duck pond where you can feed the ducks…just watch out for duck poo and angry geese. The Utah State Capitol has all the essentials – air conditioning and nice, flat stroller-friendly floors. of the city below and mountains surrounding the city. There is a coffee shop where you can stop and refuel your parent powers. And the Children’s Library is probably the most spectacular children’s area of a library that you’ll ever see. For one, it’s got a five-story glass atrium above it. For two, it’s more than just a book area – it’s a visual playground for kids with extra spaces that are decked out like a fantastical attic or wild woods for kids to explore and enjoy. In warmer months, there’s an outdoor terrace with waterfalls, too. It’s true. 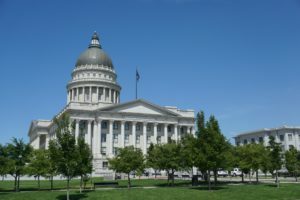 The Capitol might not seem like a kid kind of destination, but it’s got those two things I am most interested in during visits to Salt Lake City in the summer – it’s indoors and it’s air conditioned. Little Monster is just as Northwest as me at this point and she also enjoys those things. No, the Capitol isn’t teaming with activity, but the floors are smooth and level and great for a stroller and there’s plenty of space to walk around. There are statues, yoshino cherry trees lining a circular walkway, a reflecting pond, and gardens to wander outdoors…but, seriously, if it’s July, just stay inside. It’s so much better. This applies equally as much during the snowy, cold winters. You might not think of Temple Square as the place to be with a baby, but the fact is that it’s entirely paved and includes several places where you can go inside and sit down for a bit. I don’t know about you, but those two things are sometimes all I need. Beyond that, you can learn a bit about the history of the city and the temple, explore the beautiful grounds around the temple (no, you can’t go inside unless you’re a practicing and in-good-standing LDS member), or even explore your family history in the FamilySearch Center (though, be warned, babies don’t generally enjoy genealogical research). If you’re visiting Salt Lake City during the holidays, Temple Square gets decked out in holiday lights and it’s gorgeous – also a sure hit with babies and toddlers. City Creek Park is small, but it’s shady and not far from downtown Salt Lake City. 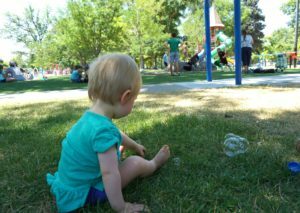 Granted, there are lots of parks in Salt Lake City worth a visit so don’t feel bound by this list, but I’m adding City Creek Park because it’s tiny and cute and the perfect place to sit with a baby. There’s a little creek (City Creek) trickling through the center of the park. There are shady patches of grass. The main park is bounded by N State Street, 2nd Avenue, and Canyon Road, but there’s another piece (my preferred spot) just a jog away starting at 3rd Avenue and running alongside Canyon Road for a couple of blocks. There’s also a paved pathway through this park, even though it’s small. If you do decide you want to walk more from here, few parks are better located. Go north and you’ll run into Memory Grove and City Creek Canyon. Go south and Temple Square and downtown Salt Lake City are just blocks away. Or just sit here in the grass with your little one and enjoy the shade. There are probably plenty of babies out there that love long hikes and walks, or will tolerate being in a baby carrier while their parents traipse over rocky terrain for miles. Yeah. Mine isn’t one of those. She likes going on walks, but not for miles and miles. 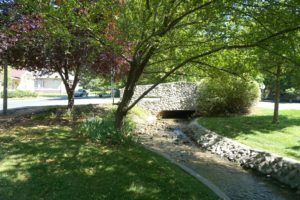 I made a list of trails and walks for babies and young toddlers in or near Salt Lake City that range from lovely neighborhoods like the Avenues to basic paved hikes like Parley’s Trail.